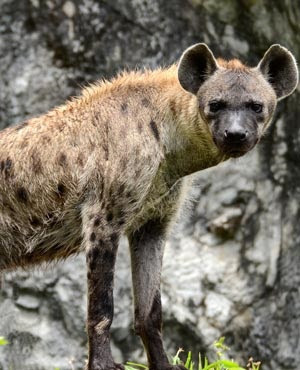 Two motorists approaching Zimbabwe's resort town of Victoria Falls this week were horrified to see a hyena dragging a human body, a conservationist says. It later emerged that the hyena had not killed the woman, but had found her body after she committed suicide, Trevor Lane of the Bhejane Trust said. "It was about 3km from the town. It's a big tar road and they saw this hyena was dragging a body," Lane told News24. Zimbabwe Parks and Wildlife Management Authority officials were alerted and came to track the hyena. They found what was left of the body more than 1km from the road, just outside the hyena's den. Lane was told that it was the torso and the top of the chest. Further investigations revealed the woman had had an argument with her husband and hit him with an axe. Thinking she had killed him she fled into the nearby national park and committed suicide. "The hyena didn't kill her. Hyenas are scavengers: they just found the body." Hyena attacks on humans are rare in Zimbabwe, but they frequently prey on their cattle. The Chronicle newspaper reported on Thursday that a single hyena had killed more than 30 cattle in the Bubi District in southern Zimbabwe since the beginning of the year. The rural district council hired a professional hunter to kill the animal, the paper said. One hyena was killed in the district last year. A 10-year-old lost her eye in 2013 when a hyena attacked and injured five villagers in the Buhera district of eastern Zimbabwe.